Keeping in mind the requirements of clients, we are offering an exclusive range of Flexible HDPE Pipe Making Machine. 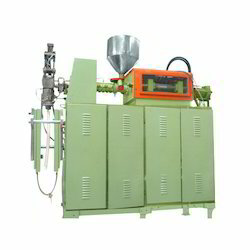 The product is used for blowing containers which are used in packaging of different items. The product comes with multi-cavity extrusion heads and can be availed in different specifications. Looking for Flexible HDPE Pipe Making Machine ?